Well Winter has well and truly arrived! I have shivered my way through today and actually haven't felt warm since I got out of bed this morning! My favourite thing about Winter (apart from the clothes - jeans, boots, scarves, jackets - I'm in heaven) is the food. Nothing warms up the house like having a soup simmering on the stove and some bread baking in the oven. 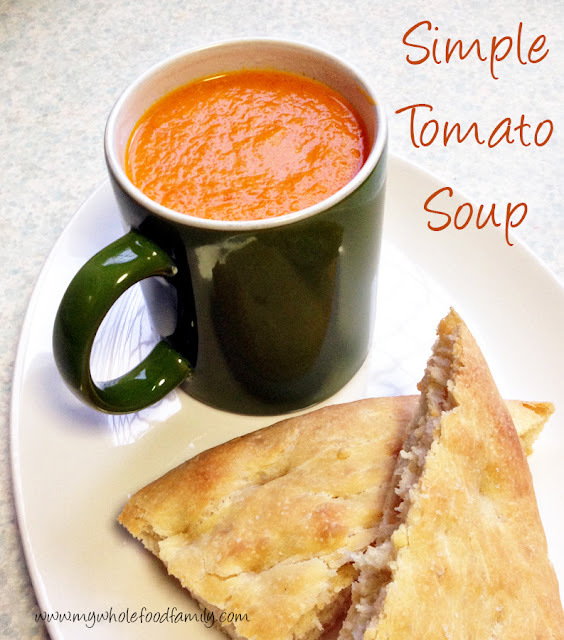 Tonight we had this really simple tomato soup with some focaccia. The simple things really are the best. I've made this soup a few times and I always wish we had more. Next time I will make a double batch so I can enjoy it for a few days. Mr fussy 4yo had a tiny little taste and declared he didn't like it, but the fact he even tasted it is huge progress. The rest of us loved it, even my 19mth old who loves his focaccia stirred into the soup to get mushy! Heat up the oil in a medium pot over medium heat, add the onion and garlic and saute for a few minutes or until they start to soften. Add the remainder of the ingredients and cook over medium-low heat for 15-20 minutes until the tomatoes completely collapse and the onion is soft. Use a stick blender to blitz until smooth. Check for seasoning and add salt and pepper to taste (I only ever need to add pepper as my homemade stock paste is salty enough).